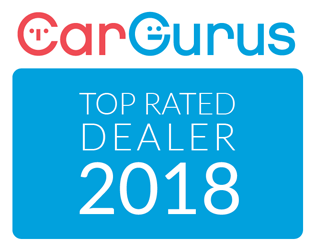 We are named as "2018 CarGurus Top Rated Dealer." The annual CarGurus Top Rated Dealer awards are presented to a select group of car dealerships that have received the highest average ratings from shoppers who have submitted dealership reviews on the CarGurus platform. CarGurus uses shoppers' dealership ratings as well as comprehensive valuation analytics to help shoppers search their local marketplace and find great car deals from top-rated dealers.